Eco-friendly banners for use outdoors. Water filled base for stability – with an eco-friendly graphic. Outdoor banners are great for attracting the attention of passersby to your business or event. We have 2 kinds of banners to choose from. Our Outdoor roller banner stands, which are available with single and double sided graphic display, and our PVC eyeleted banners. Designed with the great British weather in mind, our outdoor banners are printed on a PVC substrate using UV stable inks making them fade resistant and waterproof. 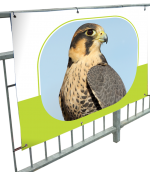 Our outdoor roller banner stands have weighted bases with extra wide twist out feet and are supplied with ground pegs to give them the extra stability they need when being used on grass or in windy weather. Our banner stands have been wind tested, when weighted down our Fleet banner stand can with stand a moderate breeze with wind speeds of between 13-18mph (Beaufort scale 4). At this wind speed, look out for paper being blown around and moving branches. When pegged down our Blitz banner stands can with stand a fresh breeze with winds of between 18-24 mph (Beaufort scale 5) where you’d see swaying small leafy trees. Are you attending an event or several events, for a day or a couple of days? Then you need something that is lightweight and portable. Either our Blitz or Fleet banner will be perfect. The Fleet has a hollow base that can be filled with water or sand that can be emptied to make moving your display easier. Picture it, you are at a country show or music event, you’re in the middle of a field and nowhere near a good water supply to weigh down your base, then the Blitz banner stand could be right for you. This banner comes with ground pegs, designed to give you extra stability while on grass. Do you have an event coming up that you would like to promote in advance? In this instance we would recommend a PVC eyelet banner, they can be easily attached to railings, fences or walls (with appropriate fixings). They are ideally placed at the side of a road so that passing traffic can see information about your event Unlike the roller banner stands, which would need to be packed away each night, a PVC banner can be securely left for a limited period– just be sure to seek permission first! Don’t forget if you can’t find the right size banner for you, custom sizes are available. You would like to promote an event but you have nowhere to attach your message we would recommend an Outdoor A-frame, they are a free standing semi permanent display which can be used on hard surfaces such as car parks or in fields. See our Outdoor A-Frames section for more information.